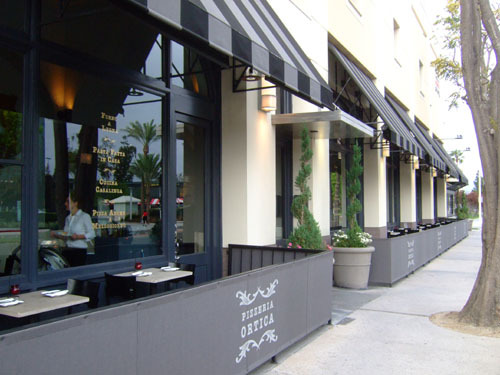 In January of this year, Chef David Myers (of Sona and Comme Ça fame) opened Pizzeria Ortica in Costa Mesa--Orange County's culinary epicenter--situated right across the street from Mastro's, just east of South Coast Plaza (home to Marché Moderne and Charlie Palmer), and just south of the Renée and Henry Segerstrom Concert Hall (which houses Leatherby's Cafe Rouge). Described by many as a sort of Pizzeria Mozza-esque concept, the restaurant serves up Neapolitan-style pizzas and other traditional Italian fare. 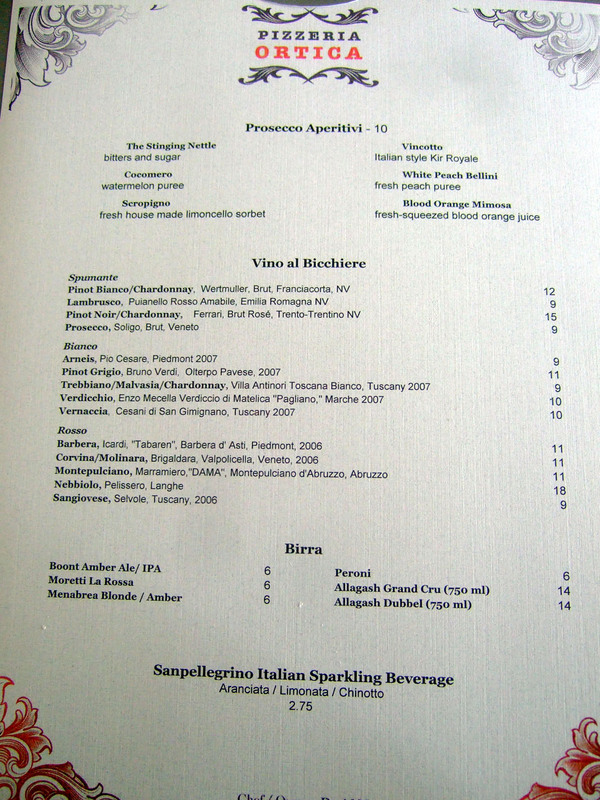 Apparently, Myers also plans to open Ortica, a higher-end Italian eatery (his take on Osteria Mozza? ), in Los Angeles, as well as a second Comme Ça, down in Orange County. 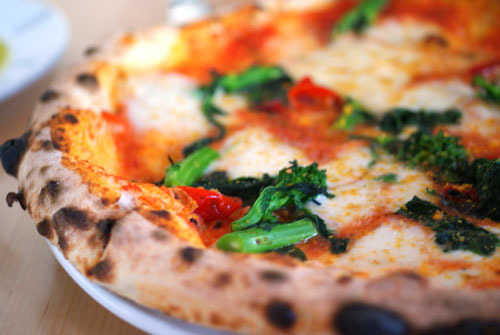 Pizzeria Ortica is helmed by LA-born Executive Chef and Partner Steve Samson. Samson attended culinary school at the Institute of Culinary Education in New York, and helped along by Piero Selvaggio (of Valentino fame), Samson was able to secure a position cooking at the Michelin 3-star Dal Pescatore in Canneto sull'Oglio, Italy. Upon returning to the US, Samson worked as sous chef at Selvaggio’s Valentino Las Vegas and later at the now-shuttered Posto in Sherman Oaks. He then traveled again to Italy, this time to the South (working at Il Duomo, Quattro Passi, and Torre del Saracino), before returning in 2000 to the kitchens of Valentino in Santa Monica. Samson‘s next job in Los Angeles was at Sona under Myers, hence his current position here at Ortica. So, I'd known about Pizzeria Ortica (FYI: "ortica" means "nettle" in Italian) for some time, and was mildly interested in giving it a try, but only made it out because Aaron of Food Destination happened to be on an assignment in the area, and invited me and Ryan of Only Eat What Feeds Your Soul out to dinner after work. Interestingly, later on in the evening, we also met up with Ila of I Nom Things at the nearby Kitsch Bar. Pizzeria Ortica is housed in the former Turner New Zealand space. Before Turner, the space was occupied by Luongo, and before that, Il Fornaio--hopefully Ortica lasts longer than its predecessors. Parking is available in the structure attached to the restaurant. 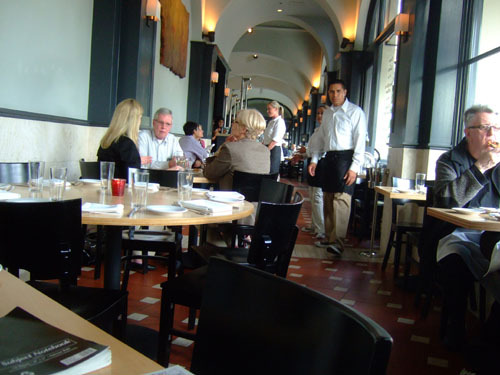 The restaurant is somewhat oddly-shaped, basically one long room. However, the space is fairly inviting, with high, arched ceilings, large, bright windows, and quaint Tuscan red tile floors. 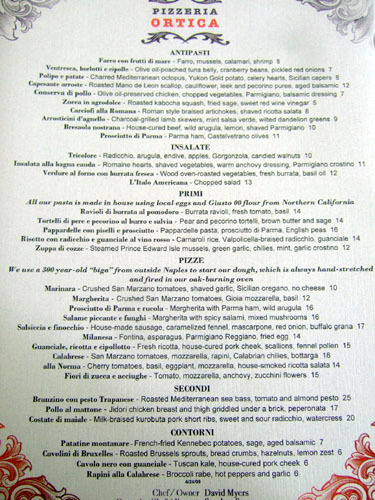 The menu is comprised of an appealing selection of antipasti, pasta, and of course, pizza. 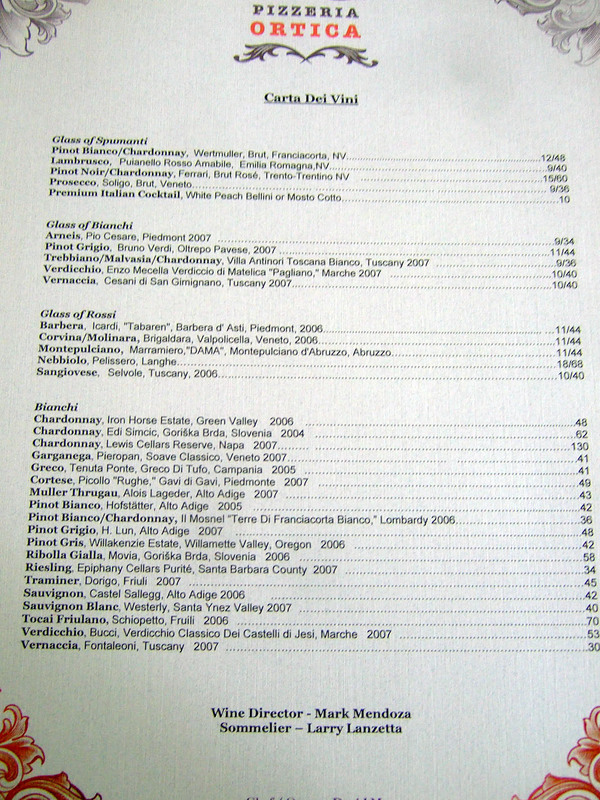 A small but focused list of mostly Italian wines is available, but I was disappointed to find out that no liquor is served, putting a damper on cocktails. Click for larger versions. Given the lack of liquor, our cocktails were restricted to the Prosecco-based variety. 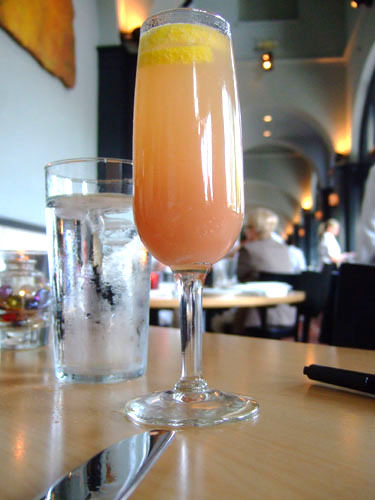 I thus started with a White Peach Bellini (Fresh Peach Purée) [$10]. 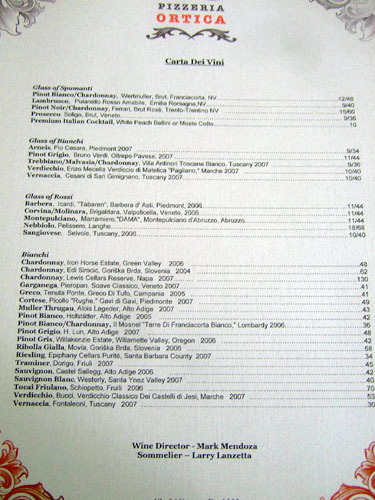 A strictly by-the-book preparation, even down to the white peach, it tasted exactly as it should. Ryan went with the Cocomero (Watermelon Purée) [$10]. 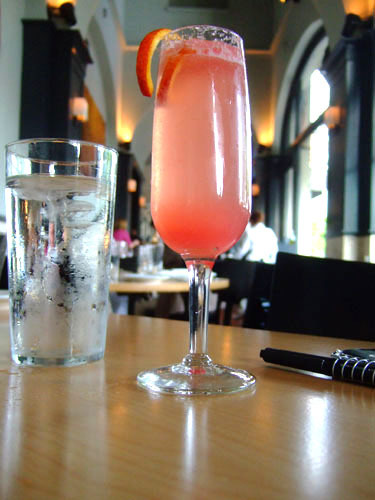 "Cocomero" means "watermelon" in Italian, so this was basically just watermelon and Prosecco; it had pronounced watermelon notes initially, followed by a sour finish--pretty good. 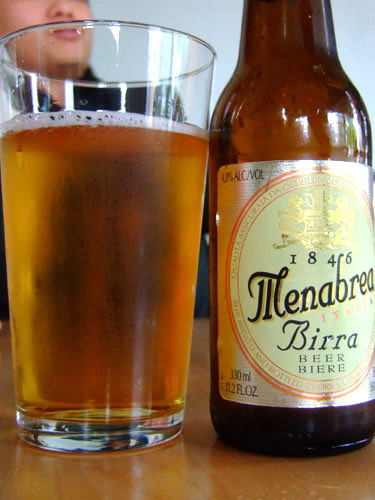 Aaron ordered a beer, the Menabrea Blonde [$6], a pale lager from Birra Menabrea in Biella, Piedmont. It was a crisp, clean, easy-drinking beer, but without much flavor--very little hops, some malt, and slightly floral. 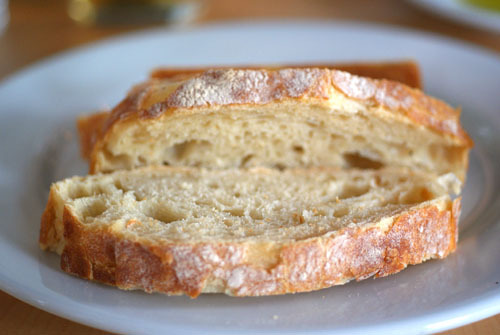 The bread was fairly unexceptional. 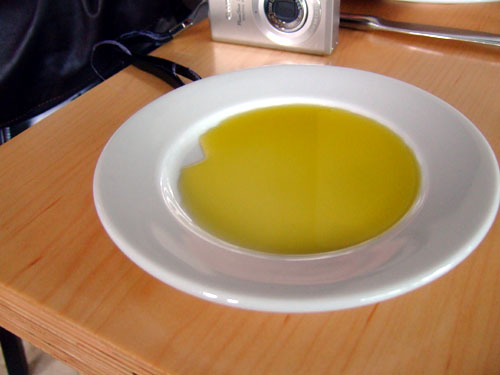 Aaron was looking for some balsamic to go with the olive oil, but it was nowhere to be found. When this came out, we all thought that it looked like refried beans topped with Cotija cheese! The rice here, of the traditional medium-grained Carnaroli variety, was mixed with Valpolicella, a type of red table wine. 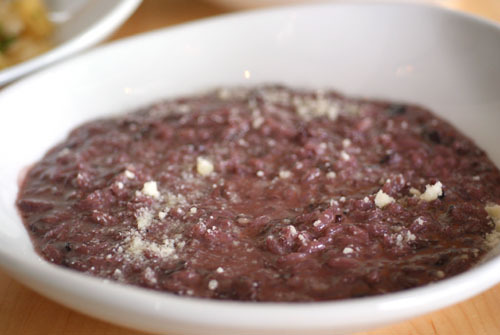 The wine gave the risotto an interesting aubergine hue, but unfortunately not much flavor. The guanciale, an unsmoked bacon, was nearly invisible as well. Instead, the risotto had a blunt, cheesy taste to it, without any focused flavors. Tasty, but one-dimensional. Arguably my favorite dish of the meal, pappardelle are basically a wider version of fettuccine, with a nicely firm, al dente texture here. 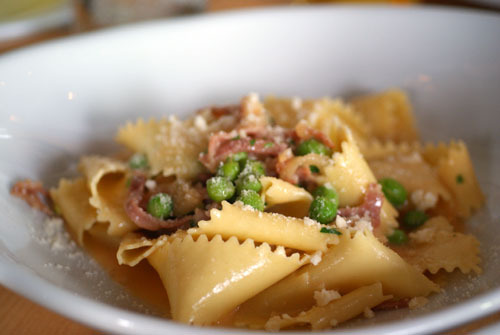 The peas were an excellent accompaniment, and the prosciutto provided a great, salty counterpoint. Simple, but effective. 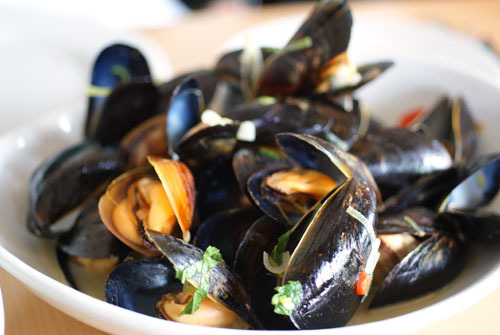 The mussels, unfortunately, were a bit of a letdown. They lacked the sharpness and crispness that we wanted, but were instead rather nondescript; the broth didn't help much either. The crostino, meanwhile, turned out a soggy, unappealing mess at the bottom of the bowl. For our second round of cocktails, I went with the Stinging Nettle (Bitters and Sugar) [$10]. The stinging nettle is a type of edible flowering plant with a bitter flavor. I guess the name makes sense then, as the drink had a bittersweet flavor to it that was actually quite fascinating. 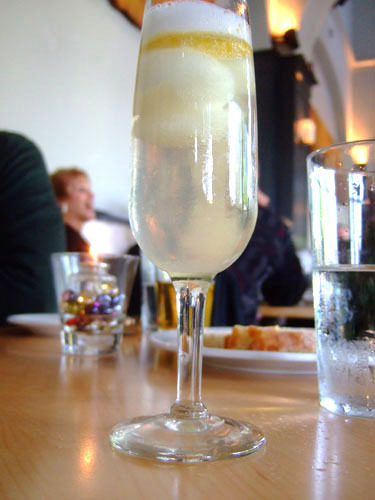 Ryan went with the Scropigno (Fresh House Made Limoncello Sorbet) [$10], which I suspect was a misspelling of Scopigno. 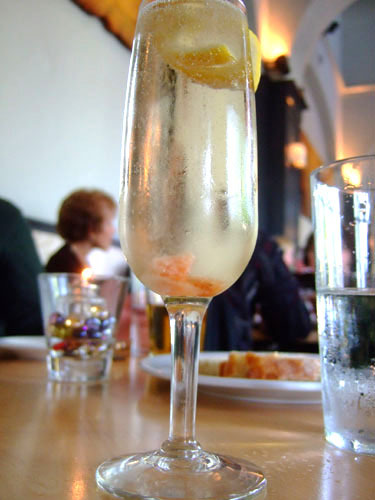 In any case, it was quite delicious, with the sorbet providing a acidic, lemony complement to the Prosecco, while also giving the drink an interesting textural contrast. 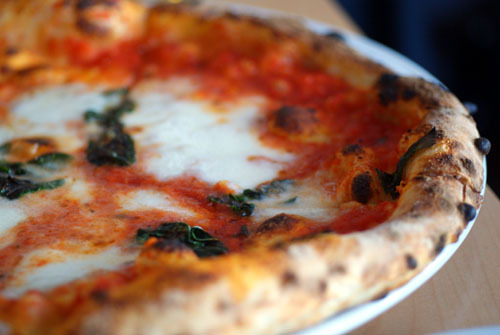 The most traditional variety of pizza, an authentic Neapolitan Margherita is topped simply with San Marzano tomato, mozzarella, basil, and extra virgin olive oil, and cooked in a wood-burning oven. 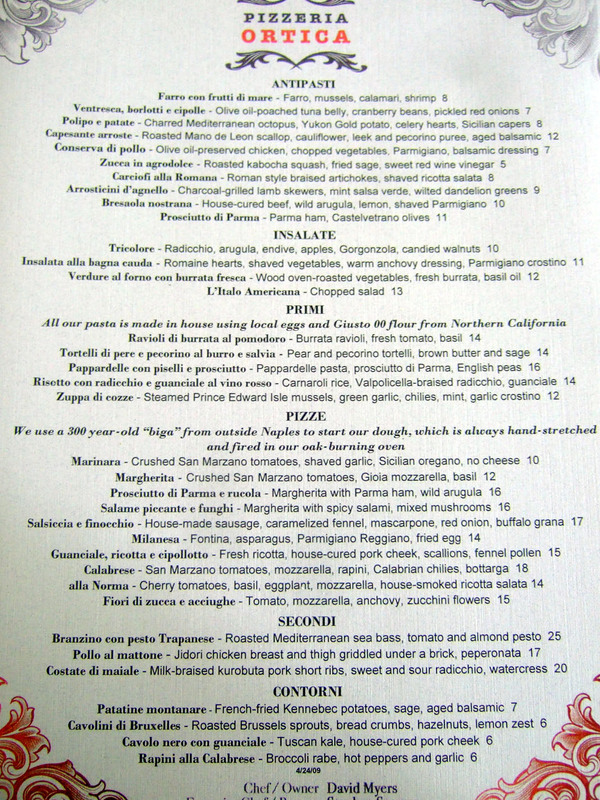 Pizzeria Ortica thus has all the necessary ingredients here, resulting in a solid interpretation of the classic. The Gioia mozzarella (from El Monte, CA) was especially enjoyable, and the basil proved a fitting contrast to the sweet tomato sauce. The crust, arguably the most important aspect of a pizza, was nicely thin, but could've been crispier. I still like the Margarita at Lombardi's in New York best. Named for the Calabria region of Southern Italy, the Calabrese starts with a Margherita base, but adds a few more ingredients. The rapini, or broccoli rabe, provided a great, bitter flavor contrast as well as a crisp textural element. Meanwhile, the bottarga, a type of cured fish roe in the same vein as Japanese karasumi, added a nice briny flavor. My favorite pizza of the trio. This pizza sounded the most interesting on the menu, but didn't quite live up to my expectations. 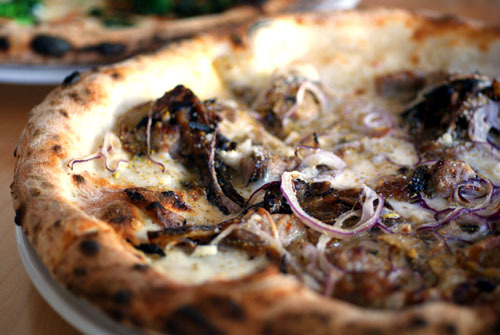 The sausage was actually sweet and quite mild and, combined with the caramelized fennel and red onion, gave the pizza a rather muddled flavor. Grana refers to hard, grating cheeses (think Parmigiano-Reggiano), and its application here provided somewhat of a sharp flavor contrast, but it wasn't enough to balance out the rest of the ingredients. 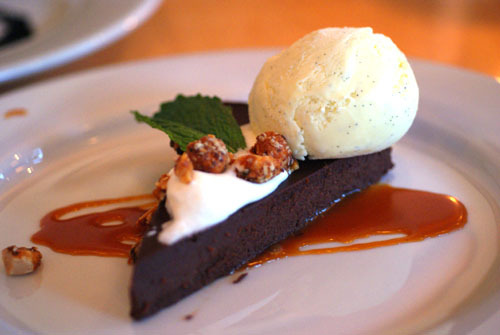 A meal just wouldn't be complete without dessert. Click for a larger version. The baking of the ricotta cheese gave it a somewhat warm temperature and a soft, pleasing consistency. Mosto cotto is basically reduced grape juice, and here it provided a tart contrast to the mild ricotta, but I would've preferred it a bit sweeter. A decent dessert, but nothing spectacular. The cake itself was rich, decadent, and dense--it would've been quite good on its own; the gelato was simply fantastic as well. Indeed, the pairing of vanilla ice cream and chocolate cake has been done to death, but it works. The use of nuts here added a salty flavor contrast, which was a nice counterbalance to the intense sweetness of the rest of the dish. In the end, my experience at Pizzeria Ortica left me wanting. I like the concept, it sounds good on paper, but the execution needs to be fine tuned--the place has the potential to be great. But as of now, it is merely decent; I expected more from Mr. Sona. Maybe it's time for me to check out Pizzeria Mozza? I haven't been yet... wasn't sure if I wanted to make the trek to Costa Mesa, but after seeing your photos... I DO. In general what kind of pizza do you gravitate towards? Thick? Thin? Simple or complex toppings? Mmm. I love pappardelle. That and the pizza look fabulous. 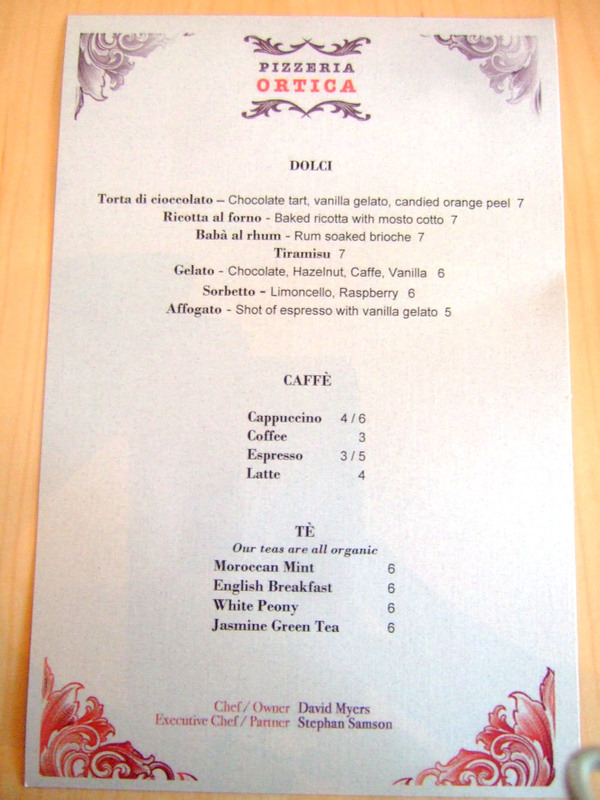 I had some pizza recently at Bottega Louie that I really enjoyed (but haven't blogged yet). I'd love to know what you think if you've been. Jo: You've been to Mozza many a time, so I'd like to see how the two stack up for you. 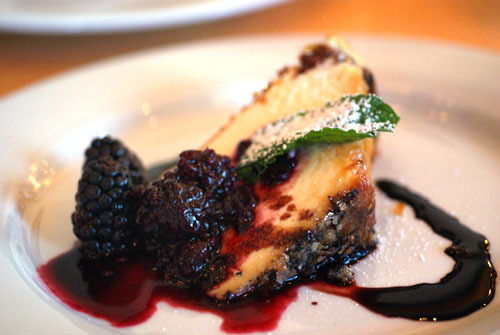 Mike: I generally prefer thin, though I definitely do enjoy a true deep dish Chicago-style. For toppings, I like it when each element has a distinct voice; it can be simple or complex I guess. Sharon: The pappardelle was the star for me. Unfortunately, I've not been to Bottega Louie. Charlie: I know, I know, I should see what all the fuss is about. I understand about the ambiance though--I felt the same way at Osteria. Aw that's actually really disappointing that your meal there didn't seem that spectacular. I was kind of excited that a place like this opened in orange county but your review really makes me kind of disappointed. Truthfully though, the menu didn't seem that incredibly interesting besides the milk braised pork or whatever. Also, it's really interesting that their supposedly fresh house made pasta has an al dente texture, my experience with fresh pasta has always resulted in really soft textured pasta that's not at all mushy. I wonder if tehy really do make fresh past. Indeed, I wanted to be blown away by the place, I really did. A truly great Italian restaurant would be a welcomed addition to Orange County. As for the pappardelle, I don't if it's truly made in-house or not, but I did enjoy it. No complaints about the texture here. too bad you weren't too wow'd by it. i haven't been, but I have noticed that a lot of Japanese people have been wow'd by it. Weird, non? I'm down for an OC event, but where??? All the best places are in LA! I wasn't terribly impressed by Pizzeria Ortica either... Maybe it's because I was comparing it to Pizzeria Mozza the whole time. I like the ambiance and service MUCH better at Mozza, but the pizza flavors at Ortica were pretty good nonetheless. My favorite part of the Ortica meal was the appetizers. Interestingly, I actually just went to Pizzeria Mozza recently. I didn't think that the flavors of the pizza were head and shoulders above Ortica, but I definitely preferred Mozza's crust. Overall, I liked Mozza, but I still don't think that it's quite worthy of all the hype. I see from previous posts that you've been to Madison, WI before. If you fidn yourself there again, I suggest trying Cafe Porta Alba. They offer one of the best Neapolitan pizzas I've had in the States. Cehck out my blogfor a recent review. Keith, CPA looks like a great spot! Unfortunately, I don't think I'll be back in the area any time soon. My sole trip to Madison was to visit my fried, who was attending the university there. He has since graduated.